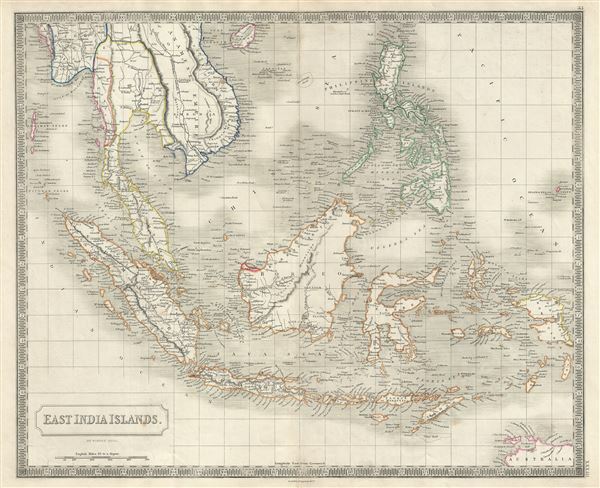 This is a beautiful map of the East Indies from Sidney Hall's extremely scarce 1850 New General Atlas. It covers from Burma (Myanmar) south as far as Australia and from the Andaman Islands eastward as far as the Philippines and New Guinea. It includes the entire Malay Peninsula, much of Southeast Asia (Thailand, Cambodia, and Vietnam), and the East India islands of Sumatra, Java, Borneo and the Philippines. The Strait, Island, and City of Singapore are all individually identified. The map offers wonderful detail regarding the coastal area of the region. Also shows some nautical details, including shoals near Borneo and the Philippines. In Southeast Asia this map notes Siam (Thailand), Tonquin (North Vietnam), Cochin China (South Vietnam), Burman Empire, Laos and Cambodia (Anamese Empire). This map notes towns, islands, bays, shoals, mountains and various other important topographical details. Elevation throughout is rendered by hachure and political and territorial boundaries are outlined in color. Sidney Hall's New General Atlas was published from 1830 to 1857, the first edition being the most common, with all subsequent editions appearing only rarely. Most of the maps included in the first edition of this atlas were drawn between 1827 and 1828 and are most likely steel plate engravings, making it among the first cartographic work to employ this technique. Each of the maps in this large and impressive atlas feature elegant engraving and an elaborate keyboard style border. Though this is hardly the first map to employ this type of border, it is possibly the earliest to use it on such a large scale. Both the choice to use steel plate engraving and the addition of the attractive keyboard boarder are evolutions of anti-forgery efforts. Copper plates, which were commonly used for printing bank notes in the early 19th century, proved largely unsuitable due to their overall fragility and the ease with which they could be duplicated. In 1819 the Bank of England introduced a £20,000 prize for anyone who could devise a means to print unforgeable notes. The American inventors Jacob Perkins and Asa Spencer responded to the call. Perkins discovered a process for economically softening and engraving steel plates while Spencer invented an engraving lathe capable of producing complex patters repetitively - such as this keyboard border. Though Perkins and Spenser did not win the prize, their steel plate engraving technique was quickly adopted by map publishers in England, who immediately recognized its value. Among early steel plate cartographic productions, this atlas, published in 1830 by Longman Rees, Orme, Brown & Green stands out as perhaps the finest. This map was issued by Sidney Hall and published by Longman Rees, Orme, Brown & Green of Paternoster Row, London, in the 1835 edition of the Sidney Hall New General Atlas. Hall, S., A New General Atlas, with the Divisions and Boundaries, 1850. Rumsey 4224.034 (1830 edition). Philips (Atlases) 758.